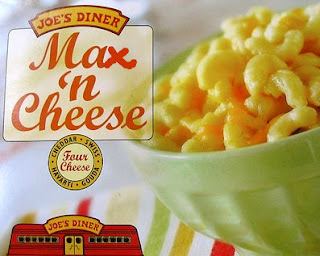 Max has a new nickname, and it is Max 'n Cheese. He also answers to Maxaroni 'n Cheese. Yes, the spaghetti phase is history. These days, Max could eat mac 'n cheese for breakfast, lunch and dinner. And, in fact, he has. If you happen to be wasting your life away on the computer late one night, you might happen to create some food labels you can slap on boxes in your pantry that will make your child think you are a Cool Mom. 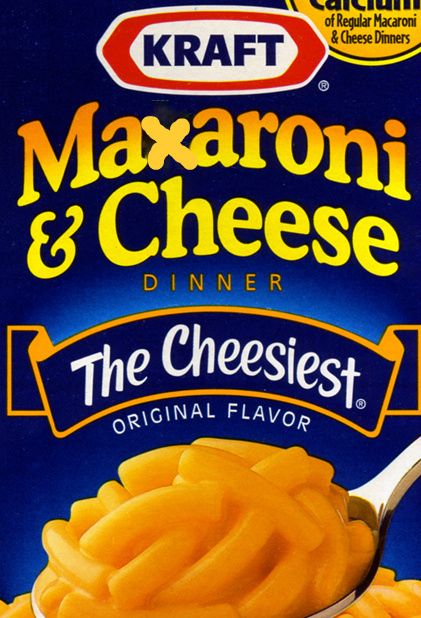 In the scheme of foods, I think mac 'n cheese is a decently healthy choice. It's also a very easy food for Max to chew, and feed himself, because of the gloppy texture. He scoops the bowl clean—no leftovers for Mommy! Turns out there's a way to make it extra-nutritious—and NOT noticeably so! My friend Betsy, master of all things healthy, recently shared a recipe she found by Food Network star nutritionist Ellie Krieger, host of Healthy Appetite. It's called Macaroni and 4 Cheeses. It's partly made with frozen pureed winter squash, which is orange so it blends right in. Max calls it macaroni and cheese pie, and asks for it regularly. It his his new Favorite Dish in the Whole Wide World. He can practically eat his body weight in the stuff. Sabrina has the more discerning palate of the two. "What did you think of the macaroni and cheese?" I asked, casually, after she'd tried it. 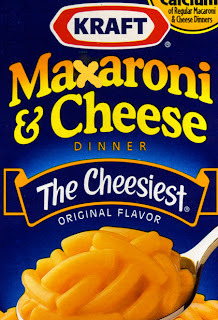 "Oh, I have macaroni and cheese all the time!" she informed me. Enjoy. 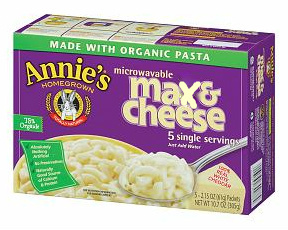 And if you have a favorite healthy mac 'n cheese recipe you've found online (or, OK, even a sinful one), by all means, share a link! We use a similar approach to food with our daughter. I sneak all kinds of veggies into some of her favorite foods like pureed spinach or zucchini in cheese grits. She loves them! One word: Cauliflower. It's highly nutritious, mild-flavored, and doesn't add tell-tale color. I add it (cooked and chopped) to raise the nutrition and lower the calories (for adult consumption)in Whole Foods' tasty but ridiculously rich mac&cheese. Mashed or pureed, it can be added to tomato sauce, meatloaf, soup, mashed potatoes--almost anything with a soft texture. I buy it fresh, but you can get it frozen and cook it a bit more to make it mashable. Squash and cauliflower mixed together cover a lot of nutritional bases, and, being orange and white, are already the color of most mac&cheese! I love everything about this - very clever and I definitely approve of Max's choice for his new favorite food. I will make sure to call him "maxaroni and cheese" from now on!!! Oh yeah, me & Max can absolutely hang!! I agree. Pureed cauliflower is a great thing to add into almost all meals. You can even use grated raw cauliflower in place of rice if you have anyone not keen on rice too. Sounds like Max and my daughter would get along great! 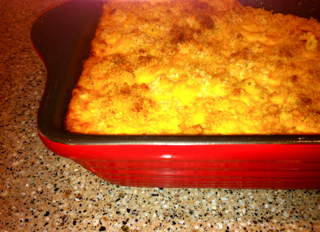 ;) My daughter is cRaZy for mac n cheese, so I'm definitely going to have to give this healthier option a try! Thanks for sharing.